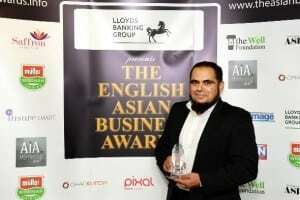 Blackburn-based KQF was named Business of the Year at the Lloyds Banking Group English Asian Business Awards this week. The event, held at the Mercure Hotel, Manchester, and supported by Asian Image, celebrated the success and business achievements of entrepreneurs. There were 16 awards presented during the evening with the prestigious Lifetime Achievement Award won by husband and wife team, Dr Sanjay and Dr Shikha Patalia, while TV personality and advertising/tech guru Tasmin Lucia Khan took home the Entrepreneur of the Year award. With over 300 attendees, including golden glove champion and actor Joe Egan, author Fiaz Rafiq and DJ Noreen Khan, the black-tie event was hosted by Miss United Kingdom Supranational Rachelle Perez along with businessman and chef director at Mushtaq’s Restaurant, Ajmal Mushtaq. KQF produce halal food products which are sold both here in Lancashire and across the UK. Operations director of the event Yasmin Mahmood said: “It was a fantastic evening and a great pleasure to be among some truly inspiring individuals. “Congratulations to all the winners and finalists and we thank all the attendees and partners for the continuing support to grow the event year on year”. Martyn Kendrick, area director for SME Banking in the North West, Lloyds Bank Commercial Banking, said: “Having met with the talented professionals at the English Asian Business Awards on Monday evening, I was impressed by both the variety and quality of businesses in the competition. The awards also helped raise more than £3,500 for the official charity partner, The Well Foundation, who aim to raise money to build wells, install hand pumps and establish health and sanitation programmes to provide accessible clean water to the stricken regions of the world.